Students and faculty living on and off college campuses have been successfully raising Canine Companions puppies for years. There are currently over 18 colleges involved in the Canine Companions collegiate puppy raising program including Tulane University, The University of Delaware and University of Texas at Dallas. Could your college be next? As a collegiate puppy raiser, you will gain knowledge and experience with canine developmental stages, learning theory, medical care, the impact of early socialization, record keeping and reporting, public relations, public speaking and communication skills. As club members, you need to work cooperatively and collaboratively to support the needs of the pups you’re raising (food, toys, basic medical care, training equipment, etc). The structure of a collegiate puppy raising club can vary widely, depending upon the requirements of the college or university and the number of participants. Your members may participate peripherally providing general club support, as club puppy sitters, or as full-time puppy raisers. A Canine Companions for Independence collegiate puppy raising club may be officially sanctioned by the school. Outside of an official school club, students, staff and faculty are encouraged to participate individually as puppy raisers. Raise a puppy, change a life. Want to start a club at your college? Check out our Collegiate Puppy Raising Club FAQs below. What is a collegiate Puppy Raising club? A club is a registered student organization, as defined by the institutions policy. The club must have a faculty advisor and consists of general members, puppy sitters and puppy raisers. Individuals must be a full-time student in good standing, or a faculty or staff member. Members must meet the minimum requirements for club membership as defined by the institution (e.g. meeting attendance, speaking engagements, etc.). Members must support Canine Companions through public awareness and fundraising. What are the requirements for being a collegiate puppy raiser? 1. Puppy raisers must meet all criteria of membership (above) and have completed their first full year of college. 2. Puppy raising applicants must complete the application and be accepted by the Canine Companions puppy program. What if I want to help, but I can’t commit to raising a puppy? You can get involved in many other roles including general volunteerism or puppy sitting (see below for requirements). What is a puppy sitter? A puppy sitter is a part-time caregiver for a Canine Companions puppy. Sitters temporarily take on responsibilities for caring for and socializing the puppy. What are the requirements to be a puppy sitter? 1. Puppy sitters must meet the general membership requirements (above) and complete dog training classes. 2. Sitters must gain approval from classroom instructor allowing the puppy to attend classes, as well as approval to house the puppy at their residence. What are the Canine Companions-specific criteria for participation? After a student has met all of the club’s requirements for raising, they can submit an application to Canine Companions to become a puppy raiser to begin the approval process. 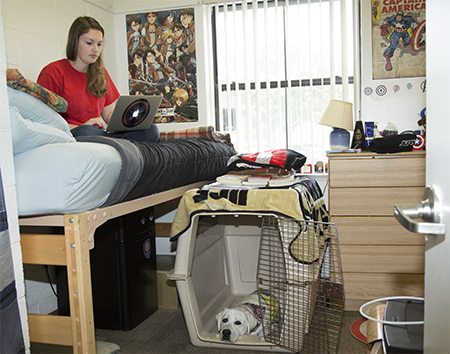 A student’s college and home/dorm environment must be compatible with the requirements for raising a Canine Companions puppy. Considerations such as course credit workload, other club or sports activities, jobs, internships, etc. are all discussed and evaluated. What are the responsibilities of a Canine Companions puppy raiser? Puppies are placed with puppy raisers at approximately eight weeks of age, and spend the first year and a half with the puppy raiser before being returned to the closest Canine Companions training center. Puppy raisers must attend a minimum of two training classes per month during class semesters. Click here for more details and the main responsibilities of the raiser. 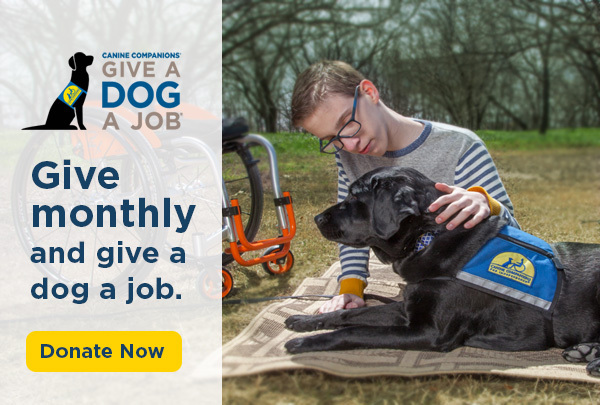 Click here for more information about Canine Companions and other ways you can get involved.